Darkness stirs beneath Tristram. An ancient evil sweeps across the land, plunging it into civil war and terrorizing the populace. A mad king, his missing son, and a mysterious archbishop are all pieces of the puzzle you need to hack through. You have journeyed to the source of this evil. The town of Tristram – now inhabited only by a handful of survivors, broken and twisted by the madness that has befallen them. A cathedral stands there, built over the ruins of an ancient monastery. Eerie lights and ungodly sounds are heard echoing through its abandoned halls, and that is where you shall venture. – Experience the legendary action/RPG that influenced an entire genre. 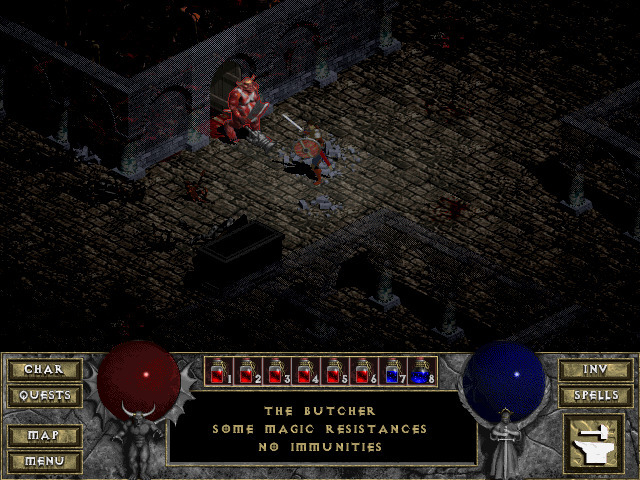 – Storm Diablo’s halls as either a Warrior, a Sorcerer or a Rogue – each with unique skills and abilities. – Unite to destroy Diablo – up to 4 players can band together via Internet, or play head-to-head via direct IP. 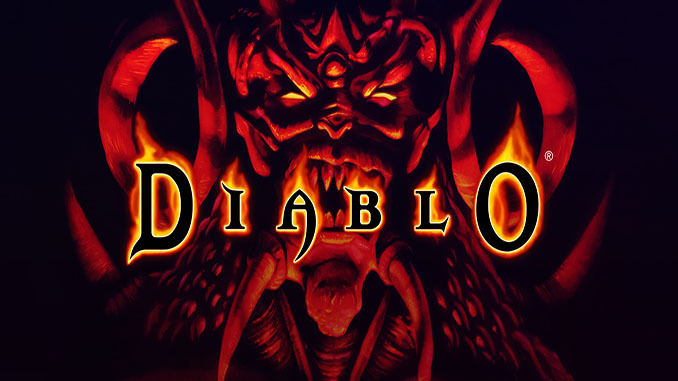 – Unprecedented replayability – over 200 different monsters inhabit Diablo’s ever-changing labyrinth. Equip epic items to conquer fearsome bosses and their minions. – A spine-chilling story – experience the horror of a world held in the grasp of The Lord of Terror. – The most voted game on the GOG.com wishlist, finally trapped in a DRM-free soulstone! – Return to the beginning of this dark saga, now in digital format for the first time ever. – Better value than Wirt’s wares, guaranteed. Diablo (c) Blizzard Entertainment, Inc.
Darkness stirs beneath Tristram. An ancient evil sweeps across the land, plunging it into civil war and terrorizing the populace. A mad king, his missing son, and a mysterious archbishop are all pieces of the puzzle you need to hack through. 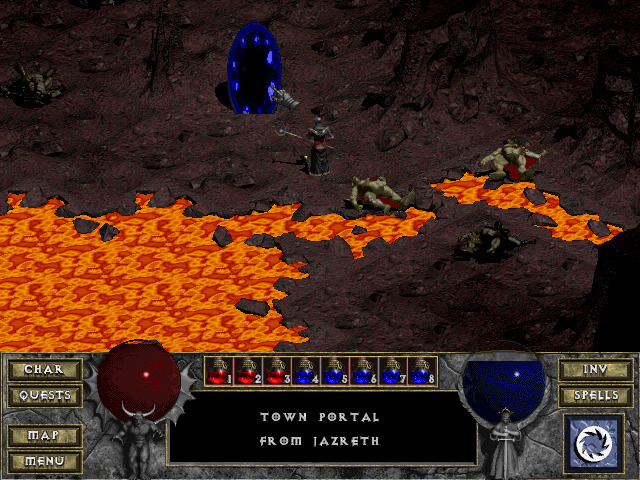 A GOG VERSION OF THE FIRST DIABLO!!! I was coming everyday to see the updates, but on the real this is the reason of all my visits. Hoping too much this game. Thanks guys, you all are amazing! By the way, someone wish to play all the game by bnet service? Like a team game. Finally! I’ve been waiting this. Thank you guys! This is a pleasant surprise! But what is this game doing here? Isn’t is exclusive to Blizzard’s store? At last , DIABLO is back !!!! Great work guys , and many thanks . Thank you, this site is the best, can you please upload far cry 4? This is something I’ve been looking for for the longest time, since it’s impossible to find any physical copies, and battle.net doesn’t allow me to download the first two diablo games for whatever reason. I tried it out of curiosity (I have the CD of the “normal” version), but it didn’t work for me, the launcher says “Can’t start appliaction because your configuration is wrong”. I tried configuring properly dxcfg.exe, ipxconfig.exe and vidsize.exe, but it still didn’t work. it doesn’t matter anyway, I can play the original. I’ll try the gog version again in some months if there’s an update. Try to install redist from Microsoft like visual C++, DirectX, and .Net Framework. Thanks freegogpcgames for this masterpiece!!! Great site!